Top View Do more with big media sizes, broad capabilities, and brilliant color on this affordable A3 MFP. Preview and control jobs on the touchscreen. 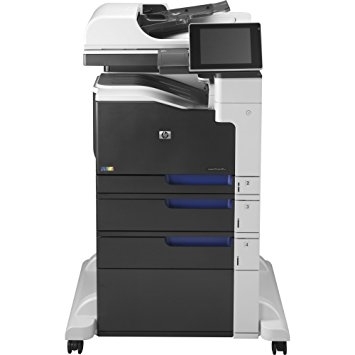 Copy, scan and fax and print from smartphones and tablets from virtually anywhere with HP ePrint. Keep large scan and copy jobs moving with a high-capacity automatic document feeder. Robust paper capacity reduces reloading. Print right at the device, using the easy-access USB. Manage access to color printing to help control operating costs. Enhance performance. Use customizable HP Quick Sets to launch one-touch workflows. Preview and edit scans on the large touchscreen for digital sending to e-mail, fax or network folder. Automatically remove blank pages from scanned documents.